On a previous cruise, the nightly entertainment was more audience participation and that got tiresome after a while. I’m sure it was enjoyable for the many passengers who raised their hands and rushed the stage for a chance to perform or chat or be part of a game show with the entertainers. And I’ll bet family members and friends in the audience liked to make videos and snap photos of the people chosen to be on the stage. 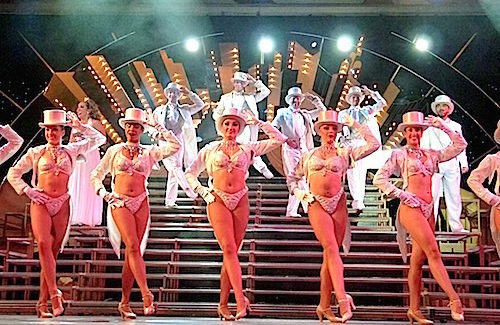 But when I go to a cruise ship evening show, I just want to sit back, relax and let the entertainment professionals do it. That’s exactly what happened on the Carnival Victory. And those performers were definitely very talented. I don’t know how they did a different song and dance show almost every night and usually had to do it twice – once at 8:15 p.m. and again at 10:15. The Caribbean Lounge theater is very large and very comfortable with an over-the-top decor. This was only a four-night cruise and different shows were presented three of those nights. 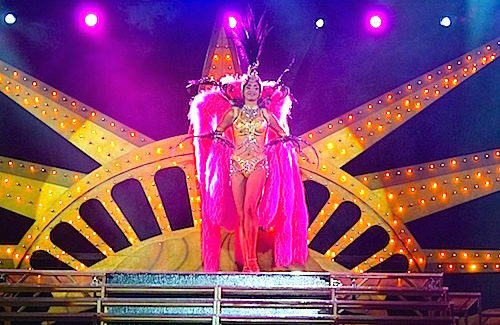 The only evening we didn’t have a stage show was when the ship was docked in Cozumel. Passengers needed to be back on board by 9:30 p.m. so no big stage show was presented. However, there was plenty of other entertainment and things to do for those who were aboard earlier than the all-aboard deadline. 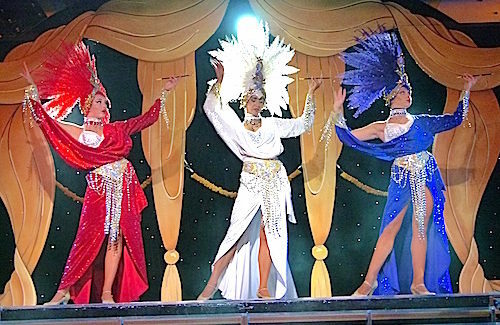 The names of the three shows were “Welcome Aboard” on the first night, which was hosted by Cruise Director Felipe. “Livin’ in America” on the second night was a fast-paced journey through the birthplace of a wide range of musical styles. When our city was mentioned in a song, Felipe said we were to give a big hurrah and applause. Don’t know why but no song mentioned Indy. “Vroom” on the last night started with a big production number with a motorcycle. Then the show went through time and across genres showcasing smash hits from such legends as Elvis, Beatles, Pink Floyd, Queen, Elton John, Madonna and more. I missed the first night’s show because it was only presented at 10:15 and I was already in bed. Travel day is no fun when you have to get up at 3 in the morning to catch the first of two flights so I headed to bed instead of to the show. Probably a wise decision. But I did see the other two shows and each presentation was high octane. Must have worn out the two singers and the dancers. Stage sets were good. Costumes were great. Live band in the recessed orchestra pit was excellent. Choreography was top-notch. And the wide variety of song choices was quite popular with the audience. I liked the productions so much that I would have gone to the second presentation if I didn’t enjoy sitting on my stateroom balcony and watching the ocean roll each evening. That is high praise that a show is so well done that it could be enjoyed again. The praise is well deserved by everyone involved in these musical journeys aboard the Carnival Victory.